Taylor Hill Exploration Ltd. (“Taylor Hill”) have acquired a 100% working interest in petroleum and natural gas rights in 33,855 acres (52.9 Sections) of lands within the Duvernay shale fairway (off reef and within hydrocarbon window which is being made available to the industry). The Duvernay shale prospect is a dynamic play with potentially high reserve potential estimates of 24 to 475 TCF and up to 19 Billion Bbls of liquids being published. Companies that have been active on the Duvernay shale are: Encana, Repsol, Chevron, Shell, Vesta, Raging River (Baytex), Paramount and Athabasca. Drilling results have been positive with liquid rates of up to 260 Bbl per million cubic feet of gas being recorded. 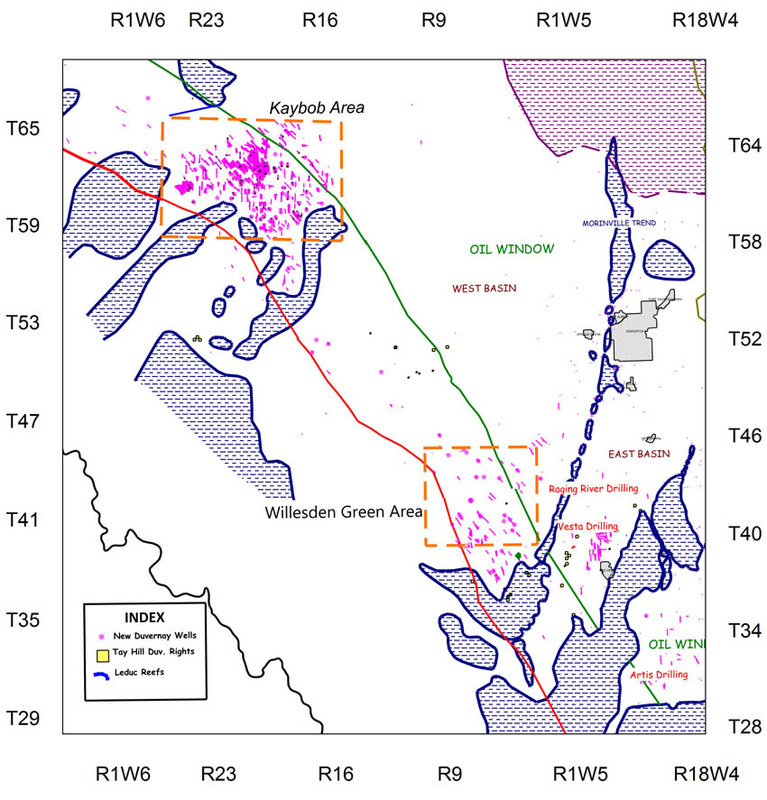 One active operator in the Kaybob area anticipates reserves of 3.7 Bcf sales gas and 516,000 Bbls liquids per horizontal well and the industry anticipates drilling 4-6 wells per section. Vesta Energy has drilled over sixty horizontal wells offsetting an EOG light oil discovery made in July 2012 at Gilby in Section 20, Twp 40, Rge 27w4. These wells have had initial rates ranging from 146 to 455 Bopd and the operator reports that it is the first commercial shale oil production in Alberta and that they have production of 4,000 BOEPD. These encouraging results indicate a significant regional light oil prospect exists where Taylor Hill Exploration Ltd. has a large acreage position at Gilby. Adjacent landsale activity has seen land on the trend sell for $750,000 per section. Taylor Hill has over 16 sections adjacent, or very close, to these sale parcels. Taylor Hill Exploration Ltd.’s large land holdings on the Duvernay would give new entrants into the play a noticeable presence to the play ormaterially increase exposure to any company currently active on the trend. Please contact Steve Benediktson, P. Geol (Ph. 403-554-5653) or Greg Johnson P. Land (Ph. 403-630-1455) if additional information is required.